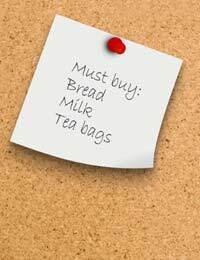 Shopping lists may seem like one of life’s boring necessities, but when you are encouraging your child to expand his or her speech, language and literacy skills they can be invaluable tools for extra practice. The next time you need to make a list, involve your child in deciding what you need, writing out the list and then reading it with you as you shop. Through these everyday activities you will likely gain more insight into your child’s current skills, strengths and weaknesses and become better prepared to help him or her as needed. Read or sound out the words on your list. Read or sound out words on advertisements or signs. Locate items in the shop based on signs. Ask for help from shop assistants. Match the word on the list to the item on the shelf or rack. Pronounce words on the list as well as brands when selecting items. Feel confident in their speech and language skills through praise or small rewards. It may not seem like your average shopping list has much to teach you or your child, but creating, writing and reading shopping lists are perfect opportunities for practicing speech, language and literacy skills. Involve your child in your shopping lists to better gauge his or her current skills, practice skills that need work and better master the skills about which (s)he feels confident. Questionnaire: Do You Encourage Speech at Home?